While vacation is nice, there is something about coming home and getting back in a routine that feels comforting. I feel that I’ve missed out quite a bit on summer in California, especially with produce, as I worked on the cookbook. Now that the recipes are done, I can settle back into my normal shopping and eating habits. I woke up early to get down to the farmers’ market on Sunday, even though I’m learning there isn’t a time early enough to avoid the chaos of the Sunday market. I picked up tomatoes, peppers, corn, kale, onions, berries, peaches, grapes, avocados (the list goes on- I shouldn’t be allowed to go hungry). I promised M brunch when I got home and this omelette was the main event, overflowing with the goodness of summer. It’s a rough estimate of the veggies and really you can use anything- kale, mushrooms, sweet corn, avocado, etc. 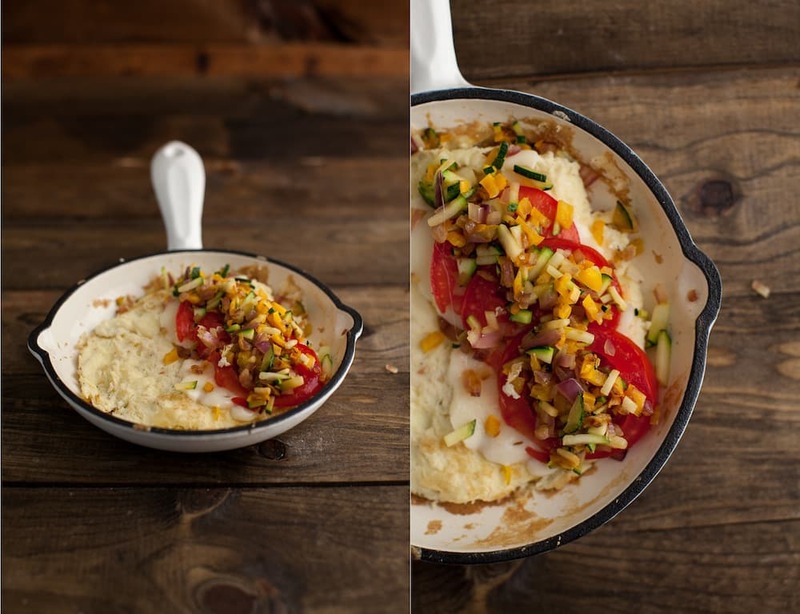 My favorite combination for an omelette is sweet peppers, corn, cilantro, and goat cheese! In an 8″ skillet, heat olive oil over medium-low heat. Dice onion, pepper, and zucchini into small pieces. Add onion to skillet, cooking for 3-4 minutes then add zucchini and pepper. Stir and cook for another 3-4 minutes, until zucchini is tender. Remove from skillet and set aside. Melt 1/2 tablespoon butter in the 8″ skillet, swirling until the bottom of the pan is covered. Whisk together 2 eggs,2 tablespoons milk, 1/4 teaspoon black pepper, and 1/8 teaspoon sea salt until eggs are slightly frothy. Pour into the hot skillet. As the bottom of the eggs set, lift up the side of the eggs with a spatula and let uncooked eggs run under the cooked eggs. Continue until egg is fairly well set. 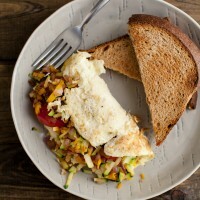 Carefully flip the omelette over and sprinkle 1 ounce cheese, half the tomato, and half the veggies on one side. Fold over and remove from pan. Repeat with remaining eggs. Love all the summer harvest these omelettes have. Definitely plan a brunch like this coming up soon! Welcome home, Erin! This looks like such a perfect summer brunch dish! Unfortunately, I will be without a stove for the next few months… Ever made eggs on a skillet on a grill?! Such a lovely omelette Erin! I definitely need to make more of these! Mmm goat cheese and all these veggies in an omelet sound amazing!! I definitely missed out on summer veggies this weekend also…so good. Yum…. 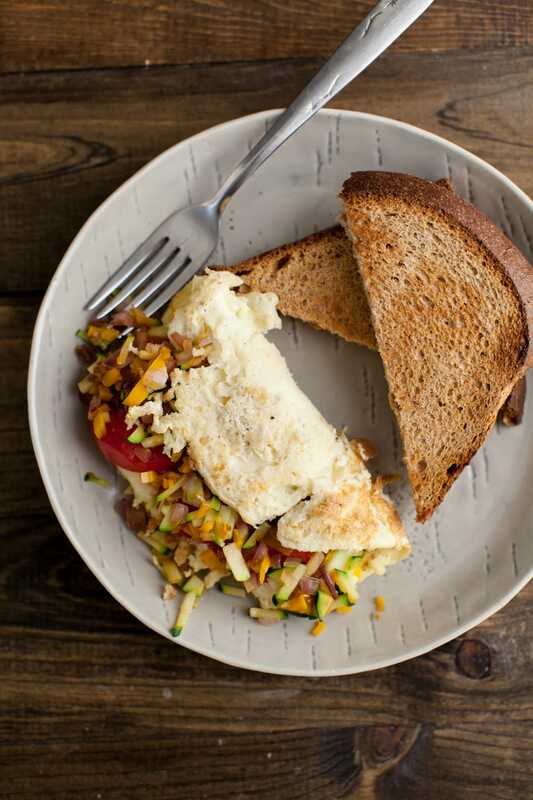 love different ideas for sprucing up the ‘ol omelette! This looks beautiful as well as delicious. I like the sound of goat cheese. What a great combination. Thank you. Gorgeous! What a fun omelette. I’ll take any dish that incorporates more veggies! Looks amazing! This must be such a comfortable breakfast for a healthy and good start of your day!